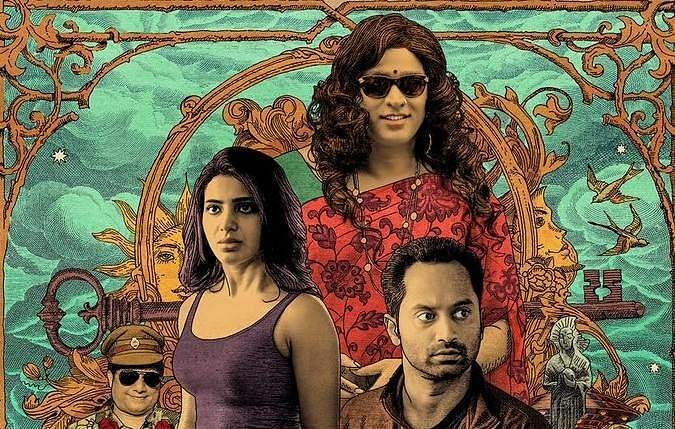 Thiagarajan Kumararaja’s Super Deluxe, even before the release of its trailer, was one of the most anticipated comebacks from an Indian director. Amid heavy buzz, following a befittingly bizarre teaser and trailer, the film is out and has instantly become somewhat of a cause even the critics want to champion. The cause of ‘good cinema doing well’. Here is someone who has worked hard (it shows), here is someone who seems to trust the audience (whether that is naïve is up for debate), and here is someone who wants to engage with the audience, not to be overly preachy, but to ask everyone to go easy. Super Deluxe is possibly an easier film to review than it is to break down in terms of its representation, especially of its women. The complication comes from the characters themselves (written entirely by men). Samantha’s Vembu, for instance, is an incredible role and she is fantastic, going from cool to funny to broken with utter ease. Kumararaja armed with a wicked sense of humour smashes the 'pathini' tag weaponised by men and held like a sword upon married women, with extremely well-timed coincidences. The film itself is an ode to coincidences and how much we take the randomness of life for granted. It attributes much of what comes as ‘sudden relief’ to luck rather than a divine design. Leela, played by Ramya Krishnan, too challenges the idea of what a mother can be in the ‘Amma’ sentiment-laden universe of Tamil cinema. In the one long shot where she runs through the hospital, she is incredible and powerful, making me wish I could have seen more of her and her life. And Gayathrie as Jyothi feels like the ultimate tribute to the women of Visu’s brand of cinema (whose Samsaram adhu Minsaram, Kumararaja has said somewhere he likes a lot). Shilpa too (played by Vijay Sethupathi) is an extremely nuanced role. She holds a secret until the end of the film. She is battling a spiritual crisis that has nothing to do with her identity and the focus on the latter through the film feels almost like a misdirection, because we are all so focused on what she’s wearing that we are missing out on what she’s thinking. Kumararaja also slips in an articulation of identity in a manner that is accessible even to someone as young as Shilpa’s incredible son. In the large scheme of things, an unexpected character tells a teenager in the movie towards the end, "We are all the same." Looking at the film purely through that message you see why Kumararaja doesn’t think it odd that a cis man plays a trans woman in Super Deluxe. And Vijay Sethupathi delivers something extraordinary. For a star who should traditionally be looking at making more macho movies with more fight scenes, so he can rake in the monies from B and C centres, to be playing Shilpa indeed shows Vijay Sethupathi taking himself as an actor far more seriously. One can’t help but wonder though, looking at our films through the ‘we are all made of the same material’ lens, will we cast trans actors in cis roles (it’s not unheard of, look at Colette for instance) any time soon? Perhaps some of the filmmakers associated with Super Deluxe (Nalan, Mysskin, Neelan K Sekar, who co-wrote the film, and Kumararaja himself) will give us something like this as they are seen as the ones radically changing the scene? I decided to write a column about representation some time ago because I found myself watching a movie every week. I love the idea of sitting in a theatre and watching a good masala movie, but also found myself shrinking at what I saw on screen often when the women came on. There were some stretches in Super Deluxe that made me flinch and feel restless. They felt incredibly long. Bagavathi Perumal as Berlin, a Sub-Inspector, is possibly the most one-dimensional role in Super Deluxe. He’s irredeemably bad, except perhaps to centipedes. And in his hands, both Vembu and Shilpa, undergo humiliation. The scenes where there looms a threat of sexual violence against these women from Berlin, felt too long and too voyeuristic, too male gaze-y. I couldn’t wait for them to end. Was it the intention of the self-aware male writers? So that when Berlin met his end it would be that much of a relief? If Berlin represents the voyeurism of male gaze, and he dies from a television crashing on his head, does that count for something? I will know more perhaps when I watch the movie a second time. Which I think a lot of us, who like sitting in a dark room with strangers, being vulnerable to someone’s ideas, will be doing.